Le logiciel Aphelion® est l'un des seuls logiciels développés par une société commerciale proposant des centaines de fonctions capables de traiter de véritables volumes 3D et de les visualiser sous forme de voxels. 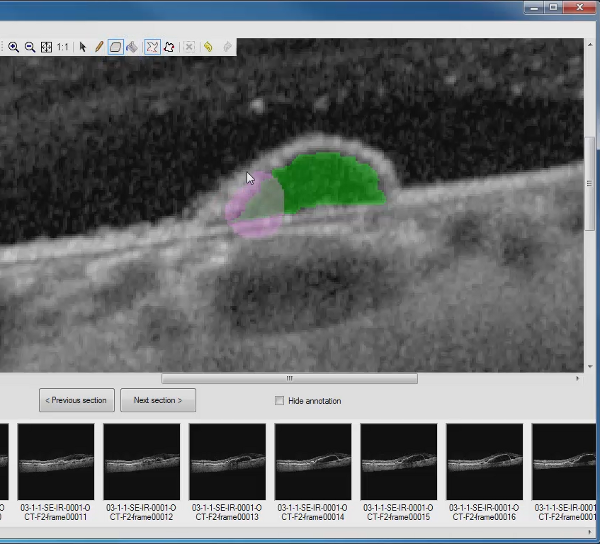 ReV Analyzer (Retinal Volume Analyzer) is a software product that takes as input OCT images of a patient, detects and analyzes the retinal Pigment Epithelium Detachment (PED) in that series of images, generates a 3D volume in the 3D space, and provides information on the PED evolution over different visits. It also works on other retina-choroidal areas in a semi-automatic way. ReVAnalyzer can be used for patients with vascularized PEDs in the scope of exudative Age Related Macula Degeneration, when the PED is visible in multi modal images. Typically, an ophthalmologic clinical examination is performed on a patient during multiple visits, and images of fluorescein and ICG angiography are captured, along with an SD OCT examination in Enhanced Depth Imaging (EDI) mode. ReVAnalyzer is fully compatible with the Spectralis HRA+OCT system manufactured by Heidelberg Engineering GmbH, Heidelberg, Germany. A retinal volume of 61 lines, centered on the fovea is captured using the Spectralis system. The volume is then exported from the Heidelberg system, and automatically imported into the ReVAnalyzer software product. A semi-automatic mode that lets the user outline the detachment in each section where it is visible, using a User Assisted tool that automatically fits to the boundary of the detachment. An automatic mode is also available that detects the detachment in the central section, once the user has manually specified that section, and then propagates through all the sections where the detachment is present. 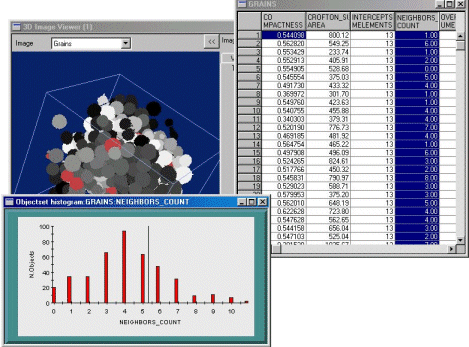 In both modes, the user is capable of visually validating the detection in each section, and using a Pen/Eraser tool to adjust the detection. 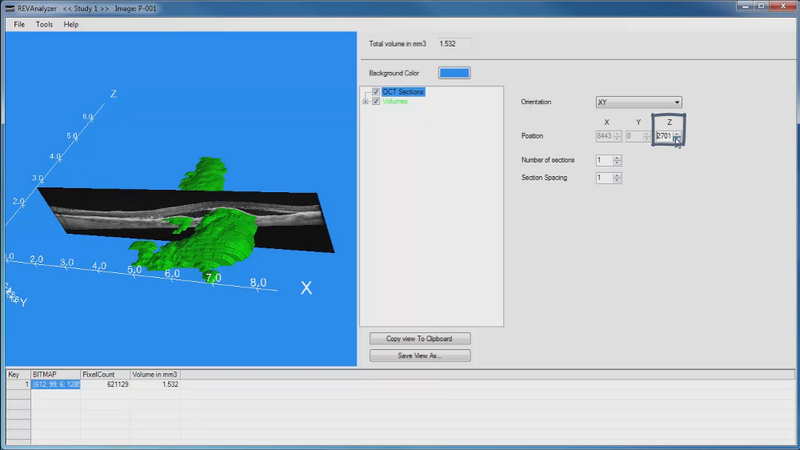 Once the detection is completed, the software automatically reconstructs and displays the PED in 3D. A full set of display parameters is available to let the user adjust the display in terms of color and orientation, display a section along with the 3D volume, zoom in and out, and move the PED in all directions. The computed volume is provided in pixels and calibrated unit (cubic millimeter). ReVAnalyzer can track the evolution of a detachment over multiple visits for a given patient, and provide a report that can be printed and saved. ReVAnalyzer has been specified and fully validated by the team of Dr. Souied, Hôpital Intercommunal de Créteil, France. A semi-automated analysis has been performed by three independent readers, twice. 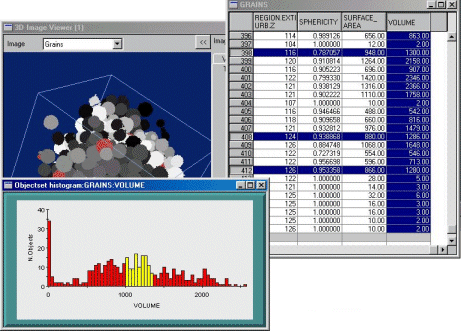 Inter and intra reader coefficients were computed based on the Bland Altman statistical method. The analysis was performed on 20 eyes of 20 patients. The value of the coefficient was above 0.99, and the location and size of the PED did not have any impact on the results. ReVAnalyzer is an excellent tool to accurately measure the PED volume, monitor its evolution over time, and evaluate its response to therapeutic treatments. It can be used by researchers in the field of ophthalmology, big pharmaceutical companies dealing with clinical studies, as well as private ophthalmologists performing patient monitoring through multiple visits.